On May 22nd, Warriors fans showed true Strength in Numbers for Game 3 of the Western Conference Finals against the Oklahoma City Thunder. Warriors Ground SF co-hosted a watch party at the former Hunters Point Power Plant Site in, just a short distance from the future site of the Chase Center. Fans were able to enjoy the game on a huge, outdoor LED Screen, take pictures with the 2015 Larry O’Brien NBA Championship Trophy, eat at some of San Francisco's best food trucks, and try their luck at a prize-filled raffle. The kids enjoyed getting their faces painted, playing with Warriors colored balloon animals and hats, and shooting buckets in the Warriors inflatable bounce house. The community came out in full force to this event, and much fun was had despite the loss to the Thunder. We were lucky to have The PG&E Hunter’s Point Site as the location for this watch party. A former power plant, the Hunter’s Point Site has been dismantled and remediated in the last decade. Ten years later, it is currently managed by NOW Hunter’s Point, an organization that seeks to transform this industrial landscape into an activity center focusing on environmental restoration and community renewal. NOW Hunter’s Point puts on events ranging from petting zoos and community concerts to job trainings, all with the goal of preserving Bayview/Hunter Point’s rich history and gathering ideas for the future of the site. It was great teaming up with this awesome organization to gather the community in support of the Warriors. We were able to spread the word about the new Chase Center arena, and were met with enthusiastic support from community members. We’d like to give a huge thank you to NOW Hunter’s Point, and look forward to throwing more successful watch parties during the rest of the playoffs! Some of San Francisco’s finest culinary talent came together for the for the sixth annual Taste of Potrero festival. Held at historic Pier 70, the evening of food, drink, and fun at Taste of Potrero benefits Daniel Webster Elementary school, located in Potrero Hill. Members of Warriors Ground SF were excited to attend the festivities and visit bartenders from Dogpatch’s very own Third Rail and Sea Star bars as well as the brewmasters from Harmonic Brewing. Also in attendance were some of the finest restaurants in San Francisco, including State Bird Provisions, Nopa, and Liholiho Yacht Club. World class dining and supporting a great cause? Taste of Potrero sounds like it will be a neighborhood hit for years to come. Warriors Ground SF is excited to introduce two of our hard-working summer interns! Maddy is a native San Franciscan and a rising sophomore at Washington University in St. Louis where she plans on majoring in American Culture Studies and Psychology. At Wash U, Maddy has worked with St. Louis Metro Market, an organization that raises awareness for food insecurity and food deserts in the larger St. Louis metro-area. In her free time, she enjoys playing volleyball and guitar, being outdoors, concerts, and food. Maddy is a huge Warriros fan and is looking forward to working in the community with Warriors Ground SF! Nico is currently a Junior at Stanford University, where he majors in Political Science and plays on the men's 2015 NCAA National Championship soccer team. Born to a French father and an American mother, Nico was born in Belgium and raised in the South of France until his family moved to Los Angeles during his high school years. Nico has been a Warriors fan since moving to the Bay Area! Warriors Ground SF Summer Interns will gain hands-on experience in community organizing and outreach. They will help lead our efforts to engage, educate, and activate Warriors Ground SF members and San Francisco residents. Be sure to say hello when you see them out and about in your community! Want to watch the Warriors playoff games with other enthusiastic supporters of Dubnation? SoMA StrEat Food Park and Pete’s Tavern are the places to be! Members of Warriors Ground SF will be on site during every playoff road game getting the crowd hyped and passing out giveaway items! 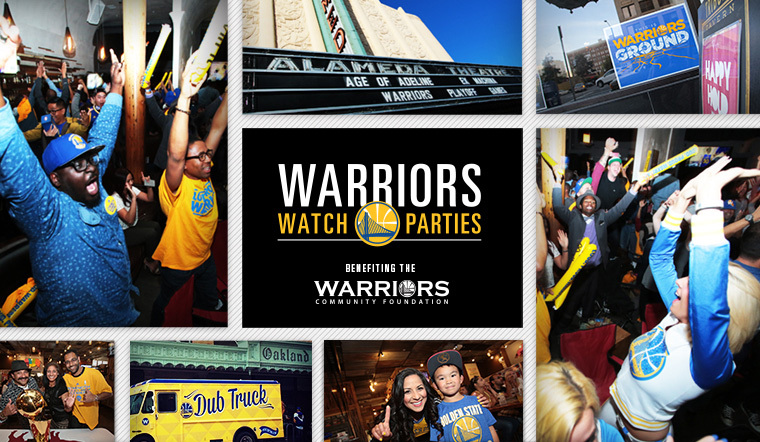 Not only are Warriors Playoff Watch parties a great way to enjoy the games, but proceeds benefit the Warriors Community Foundation, which is dedicated to making a significant and lasting impact on the lives of underserved youth in the San Francisco Bay Area. For more information, check out the official watch party site. We hope to see you as the Warriors continue their quest for back-to-back NBA Championships! Warriors Ground SF is proud to be a part of Sunday Streets for the third consecutive year! Sunday Streets is a program that closes stretches of San Francisco streets once a month to automobile traffic, encouraging recreation, community activities, and fun! Sunday Streets is an affordable way to support public health goals and provide physical activity opportunities in neighborhoods underserved for recreational resources. Local vendors, community groups, and nonprofit organizations have the opportunity to set up booths along Sunday Streets routes and enjoy the afternoon with local residents. On May 1st, we set up shop along 3rd Street for Bayview Sunday Streets—just a few minutes South of the new Chase Center arena site. Volunteers from Warriors Ground SF joined local nonprofit group Young Community Developers to help spread the word about the new arena development, pass out Warriors cheer cards and headbands, and even challenge Sunday Streets participants to a game of horse at the Warriors inflatable bounce house. This event was a huge success and allowed our team to meet enthusiastic neighbors of the Bayview. We look forward to participating in Sunday Streets again next month in the Sunset District!